4” ED refractor vs 6” f/5 newt for visual on a DM4? I am an imager but want to do a bit of visual. It is just for quick looks while the imaging rig is running, may be with kids. I have acquired a used DM 4 with encoder for this purpose. I have narrowed down to these two options. The 4” ED would be a skywatcher ED100. The newt would be either GSO or skywatcher. I do not want to be bogged down with set up but I think both should be fairly grab and go. Collimation is not a big deal after my expiernce with my imaging newt. I have good collimation tool. With the kids they will be mostly interested in planets or really bright stuff. It is about seeing rather than detecting the object. For me I do want to see some DSO for variety, as I found that I can’t look at the same thing for very long. The price differential between a newt and a 4” refractor is quite large where I am, so this is in newt’s favour. I do like the ease of use of a 4” refractor. What do you think? Personally I'd probably go for the newt. More aperture = more fun for kids. The refractor is a bit easier to use, but maybe you could get a cheapie ST80 or something to supplement the newt. Looks like you have some pretty nice gear already. Sell the DM4 and get an 8" dob for observing. I had a 8” Dob before I got into imaging. I hated it as it was bulky and despite a telrad I could not find anything. I prefer Goto myself but alignment takes too long, so the DM4 with encoder is a compromise. if the sky is clear the gear on my signature will be used for imaging, hence they are not really available for visual. Both are really fine choices for grab and go and visual. I have both, and Both produce an image that is more alike than different. The refractor will be easier on cheap wide field eyepieces. The newt will give you more light to work with. I would lean toward the newt given the big price difference that you see. Unfortunately I don't have a DM4 to tell you how the scope will behave on it. It looks beefy from the pics. I have a vixen porta mount and it does not hold these well. "roll" axis. Both scopes almost work on the porta, but not quite. load capacity like some other mas market vendors do. Because vendor specks on weight vary wildly here are the weights of my scope. my celestron 150mm f/5 newt weights 11.5 lbs with rings and dovetail. my orion 100mm f/9 refractor weighs 8 lbs with rings and dovetail. Curious; I find a 6-inch f/5 Newt much easier to use than a 100-mm refractor, except for the cooldown period. In all likelihood, the views of planets and other bright objects would be much the same between the two instruments, but if the Newt has a really good mirror, then it would be clearly superior. Not by a huge margin, however. The main virtue of the 100-mm APO for me would be the significantly wider well-corrected field of view. Depending on the APO's focal ratio, of course. I have owned a couple of 6 inch F/5's and a couple of 4 inch ed/apo refractors. 6 inch F/5 Newtonians tend to get into SCT size central obstructions and thermal equilibrium is not a given the way it is with a refractor. I would go with the refractor because it's more reliable, it's provides nice views of the planets without waiting for it to cool. 6" f/5 newt. To my eye though the 4" ed will be sharp and high contrast, 6" will out resolve it. First of all the DM4 will handle either scope easily. I have a DM6 and it handles my pretty heavy TAK TOA130 or my Celestron Ultima 11 with no problem. Im sure it could handle much more weight. It is by far my favorite mount. I would side with the 4" refactor. It is such an easy grab and go scope set up and on this awesome mount I think it would be great. There is something about my DM6 and Tak 130 combo that makes it my overall favorite set up for visual. 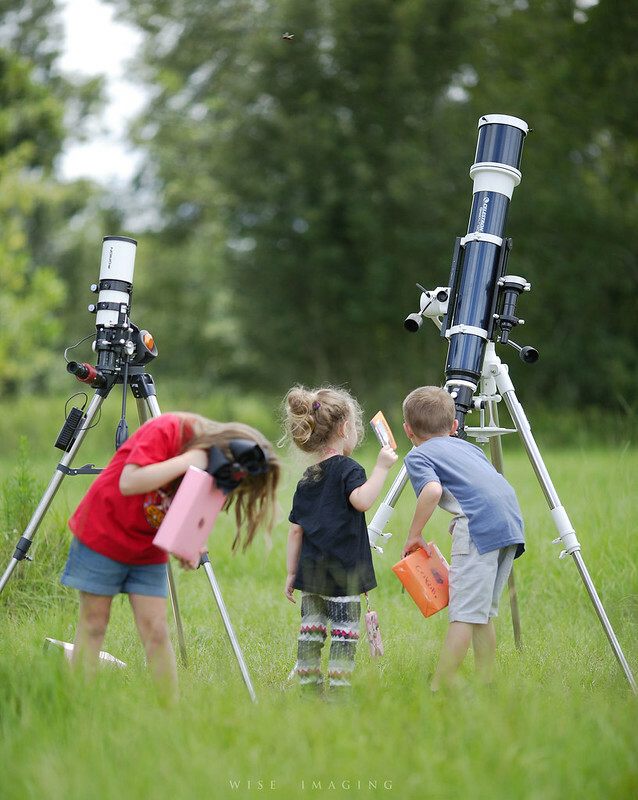 Especially with kids, the DM4 and 4" refractor would be an easy fun set up and balance and tracking by hand will be very easy and intuitive. My 2 cents! I had a "test-the-water" session with the DM4 tonight with the kids. And it was a limited success! Firstly I discovered that the DSC ("BETI") that came with the DM4 did not work with Sky Safari on iOS - it uses bluetooth, and for iOS version of Sky Safari bluetooth is not supported. Fortunately it worked with Sky Safari on macOS - so for this session I used the my laptop. Alignment - was a contortionist exercise because the Travel Scope has a tiny finder that is only couple of cm above the OTA. The way the scope needs to be mounted on DM4, the finder is basically at the bottom the OTA. Therefore I literally had to lie on the floor to see through the finder. However once aligned Sky Safari kept track of the telescope pointing fairly well. All objects were always in the FOV when the bull eye on the screen was on the targets. During this alignment process, the 8 year old got fed up waiting and went to do something else, but the 6 year old was happy to wait by my side. In use - tonight Venus, Jupiter and Saturn were all visible, so we had a look at all three. Once I have shown the 6 year old how to move the telescope based on the screen, he had no problem moving the telescope himself and found all three planets. Despite the fact that Venus was just a bright blob and Saturn was just a slightly elongated bright blob on this telescope, he was happy enough. Jupiter was particularly good, not because he or I could see any detail on planet itself with that 70 mm scope, but because we could both make out the moons alongside it. I made him count the moons to verify that he could indeed see the planet and the moon. After a while he moved the telescope around to look at other things. I got him to move it to Omega Centaurus and he could make out the fuzzy white blob in the middle, and I also got him to look at a couple of double stars (e.g. Acrux). At that FOV, the objects were hardly moving so tracking or the lack thereof wasn't really a problem. By then my 8 year old decided to join. He is always the impatient one but even then he managed to look at the planets and was able to move the scope himself to do so. By that stage it was 9 pm and the computer lost connection with BETI for some reason so I called it quit for the night for them. So, as far as the mount is concerned, I believe it is the right choice. Push-to just seems so much more intuitive. With goto I have to man the hand controller whereas with push to the kids get to control the scope themselves. The alignment still took me a while, but that was partly because of the unfortunate position of the finder. It was still much much faster than the GOTO AltAz mount that I have since sold. I do have a laser gadget so I may use it next time to see if it is easier/faster. With kids it is inevitable that the mount gets bumped a bit but reacquiring the alignment with the DM4 is easy. With the goto mount when the alignment is lost one has to start from the beginning again. With Skysafari and encoder, we managed to put the objects in the FOV without fail after the initial alignment, a far cry from my distant past experience with a Dob and Telrad which I shall never return to. Overall I am very happy with the DM4 / encoder / SkySafari combo. It is a shame that the DSC does not work with iOS, so I will either have to buy the newer version which uses Wifi and is compatible, or buy a cheap Android "thing" to run Skysafari. I still have not decided on the OTA yet, but I now know that it is something that is worth investing money in. During this test, the 70 mm Travelscope seemed like quite a natural / intuitive thing to use, so may be the same also apply for a 4" refractor, which at the moment is what I am leaning towards. It is about 3-4 times the price of a newt though. If only there is a second hand one locally I would snap it up. Between the 102mm APO and the 150mm reflector, you will get good views from either one. I would say the deciding factor would be comfort of the eyepiece location on your DM4. If the eyepiece on the reflector is at the front end of the scope, after balancing, and looking at 40~60 degrees, how far up is the eyepiece? Also, you view on the reflector from the side. With a push-to system, will it still be intuitive for the kids? Mean while, a refractor is looked through at virtually the same place regardless of position at slightly different angles (if it's a short one, a long one is different of course), but at least it's pointed in the direction you're looking for push-to purposes. That may be the deal maker or breaker for ease of use. Personally, I would lean towards the refractor for eye placement and intuitive pointing on an alt-az system. But, it doesn't even have to be an APO. A F7~F10 Achromat at 4" is affordable and quite good. Like the Omni XLT 102 F10 or ExpSci AR102. That said, if you end up with a long refractor, remember, your mount will have to be way high up in the air for them to get a peak at anything high in the sky as that eyepiece will be way low to the ground real quickly with something F8~F10. 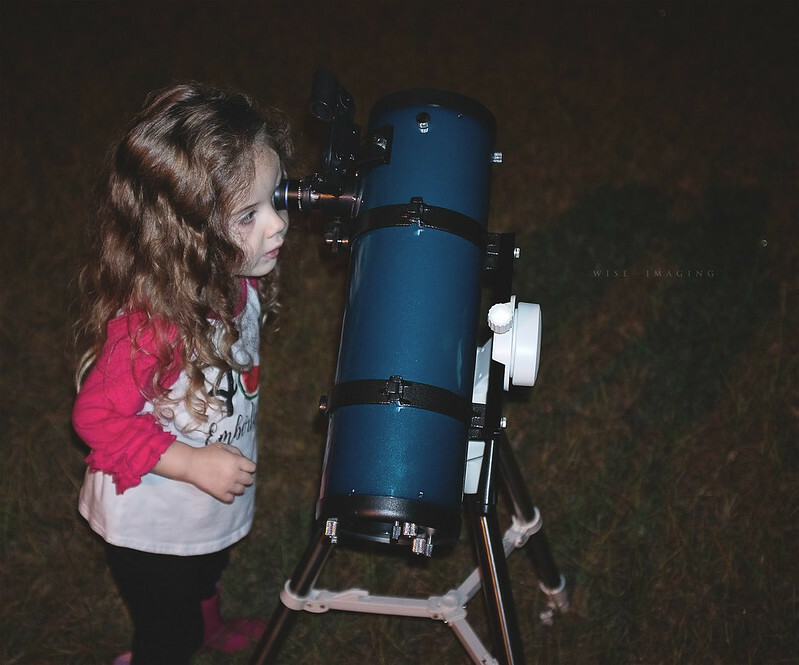 These 4~6 year olds have to stoop down to look through the 5" refractor, but the 80mm short tube is at an easy height to see. So again, comfort for the kids matters with respect to eyepiece placement. Although, those young backs and necks can bend a lot easier than others! Edited by MalVeauX, 03 August 2018 - 09:22 AM. I have a DM-6 but I'm pretty sure the DM-4 will work for most 4" scopes. Tom T did a review on the mount way back when. If you want to integrate it with Sky Safari, you can use the Nexus DSC. If necessary (I doubt it is), there's an encoder upgrade kit available from Astro Devices. As for which scope is preferred - after you account for obstruction and reflectivity, a 6"f/5 behaves very much like a 5" refractor. This translates to a little less than half a magnitude in brightness. In exchange, you get a scope that just works - take it outside, align it and off you go. I've built a lot of scopes including a 6"f/5. I greatly prefer my refractors - sometimes the haptics just work better. I'm not so sure I believe this - my E160 (6.3" f/3.3) handles a 22 Pan and ES 17/92,12/92 & 9/120 quite fine. It could be the ultimate rich field scope. It rides quite fine on a DM-6. That said, I still prefer my refractors. I switched out the focuser with a Moonlite (there's a special model to suit the E-160.) I then had Precise Parts fabricate an M54-M68 adapter that allows me to attach a 2" Clicklock into the field corrector. Mechanically, there's no issue with the ES eyepieces so it would really be a question of how the Ethos handles f/3.3. But... I don't have one Jon and I don't know anyone who does. Offering a 25x / 6.3mm exit pupil, it might be interesting under a dark sky. I am more interested in the illuminated field of view, the eyepieces you mentioned have somewhat narrow field stops. 27mm max versus 36mm. I calculate that's a 3 degree versus a 4 degree TFoV. I don't think there's much doubt about the 21mm Ethos, Mel Bartels designs his ultra fast scopes around it. His newest is a 26 inch F/2.6 which operates at F/3 with the Paracorr. Ah - now I get it. The E-160 delivers a 48mm diameter illuminated disc if you use the original corrector and a 44mm diameter disc with the ED corrector which was offered for a brief time, 8 or 10 years back. The respective spot sizes are quoted as 25 microns and 15 microns respectively. Viewed from 21mm, a 25 micron disc subtends a little more than 4 arc-minutes so the ED corrector is probably greatly preferred, even if it has slightly greater vignetting. To be complete, I replaced the original corrector with the ED corrector 9 years ago and have not gone back. Even though the optics are far from diffraction limited, my experience has been that this is adequate. The 9mm eyepiece is probably a bit much. I'd go with the SW 100ED and I'm mostly a Dob guy. That 4" is a really nice scope and is extremely easy for anybody to use, especially on a mount like a DM4. If you're running the Nexus DSC on it the kids will be able to search and find a lot of objects on their own pretty soon if they develop an interest in a few years.